This year, Season of Sculpture presents Season VII’s “Shared Ground: Eight Artists, Eighteen Installations.” Eight highly acclaimed artists of regional, national and international renown, will exhibit eighteen large-scale works throughout Sarasota’s beautiful downtown Bayfront Park from November 16, 2013 through May 2014. Many of us have memories of climbing over outdoor sculpture as children; we were free to explore and react to the look, sense and impact of a work of art in its ever-changing natural surroundings. Free from the encumbrances of traditional indoor settings, we experienced art in a fresh and approachable way; sometimes serious, sometimes playful, but always visceral and untethered from rules of art protocol and gallery decorum. If we were lucky, this was our introduction to sculpture- to be fully engaged, curious and physically interactive without restrictions; and this is exactly the opportunity Season of Sculpture offers to newcomers and established fans alike over the course of the next six months. Season of Sculpture is a local not for profit, 5O1 [c] 3 organization that produces a biennial, international exhibition of large-scale sculptures along Sarasota’s bay front. It’s free and open to the public 24/7. Their mission is to enrich the cultural and educational experience of residents and visitors. The organization relies on donors, sponsors, volunteers and artists to bring these nationally acclaimed, international invitational exhibitions to Sarasota. “Shared Ground,” curated by Fayanne Hayes and Andrew Maass, presents sculpture by Heinz Aeschlimann, Hans Van de Bovenkamp, Robert Chambers, Richard Herzog, Linda Howard, Jun Kaneko, Jae-Hyo Lee, and Boaz Vaadia. Docent-led tours will be offered, as well as public and student educational programs. A satellite exhibition of the artists’ smaller works will be exhibited at the Sarasota Herald-Tribune building at 1741 Main Street in downtown Sarasota from January 7th through May 3Oth, 2014. As the director of public relations for Season of Sculpture, I’ve had the opportunity to ask the artists about their work. A series of brief interviews with them will appear in this column, starting with Boaz Vaadia. 86″h. x 12O”w. x 8O” d.
91″h. x 36″ w. x 36″ d.
Vaadia was born in Gat Rimon, Israel in 1951; He was a self-taught artist until he could afford to attend the Avai Institute of Fine Arts, from which he graduated in 1971. He taught himself welding and stone masonry and built his first casting foundry for bronze following his graduation. In 1975, he was awarded his first, of two, American-Israel Cultural Foundation grants to study in the US, where he has lived and worked ever since, in New York City. 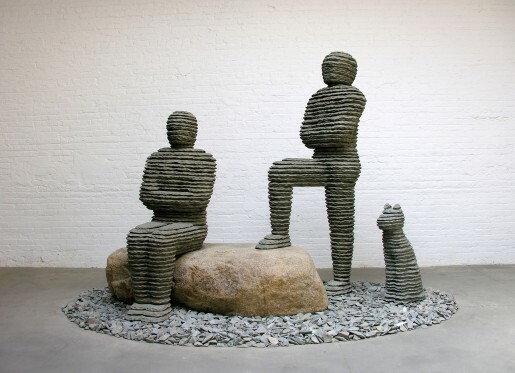 Vaadia’s unique sculptures, either in bronze or stacked bluestone slate, evoke his Israeli heritage in a meditative, contemporary, yet sensual style. His work is permanently sited in numerous public collections, as well as museums and private collections throughout the U.S. including: The Metropolitan Museum of Art, NYC; the San Francisco Museum of Modern Art; the Tokyo Metropolitan Teien Museum; The Israel Museum, Jerusalem; the Time Warner Center, NYC; The Ravinia Sculpture Park, Chicago; the Independence Park, Tel Aviv; and The Philharmonic Center for the Arts, Naples, FL. PB: How long did you think about this sculpture before working on it? BV: Most of my sculptures take several years of thought and study before I begin carving. PB: Who/what are some of your influences, artistically or otherwise? BV: Mainly ancient stonework, but also sculptors like Michelangelo, Noguchi, and Giacometti. 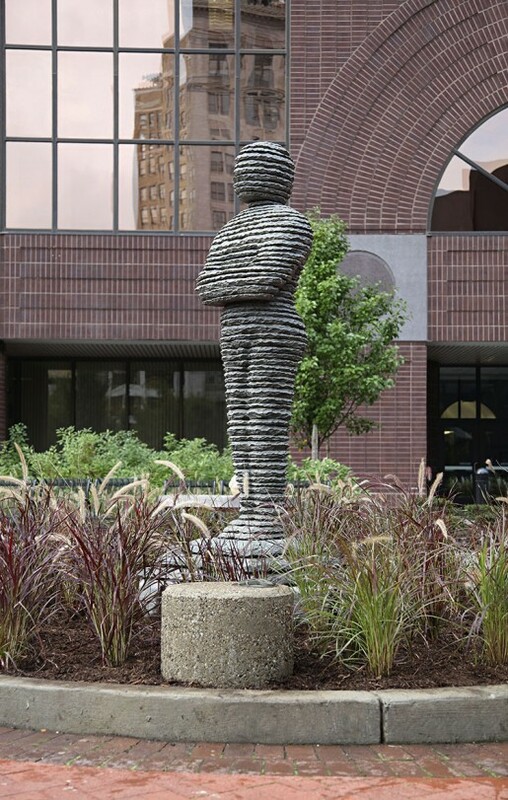 76″ h. x 12O” w. x 1OO ” d.
PB: How do you anticipate that your sculpture will look different in the bay front setting? BV: As my work is layered I believe it will connect well with the environment, looking as though carved by winds from the bay. PB: What made you choose to do a work of this size? BV: My work is based on the human scale, allowing viewers to interact with it in a more personal way. The natural materials I work with also help determine the size of my work. PB: What is your favorite hobby or pastime other than your art? BV: Meditation and spiritual studies. 65″h. x 9O”w. x 8O” d.
Pamela is Public Relations Director for Season of Sculpture and a private art consultant. She co-owned Pannonia Galleries in NYC. There she was also an art appraiser, private art dealer, art fair exhibitor and catalogued paintings, drawings and sculpture at Sotheby’s. She was Communications Director for The Essential Element. Pamela has a keen interest in the arts and supporting Sarasota’s future as a lively, diverse and forward thinking city for young and old. Pamela is a member of The Fine Arts Society of Sarasota, Curatorial & Acquisitions Committee and Institute for the Ages Volunteer. Season of sculpture one of my favorites! One more thing to look forward to when we get back to Sarasota. It is a wonderful idea to take advantage of the waterfront in this way. I look forward to the future profiles of the participating artists. I have had the opportunity to visit Vaadia’s studio in Brooklyn on a number of occasions as that is where the New York chapter of the Gurdjieff society holds their meetings.I have really been captured by Vaadia’s sculptures which capture the essence of man’s connection to nature. 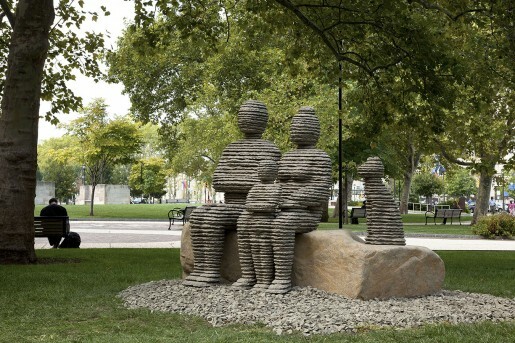 I look forward to visiting these works in such an outdoor setting!